I have read a LOT of books over the last few years about writing and marketing for authors. And no matter if you are self published or traditionally published, as an author, you need to know about both. I have been thinking a lot lately about what books every writer should have on their bookshelves (and have READ them), if they want to make a career out of their writing. So I am about to give you my three recommendations. This was published in 2000 and has since become one of the most recommended ‘must reads’ to every writer. And for good reason. The book is basically a small memoir focusing on King’s ‘writing/career’ experiences and a mini guide book for those who want to be writers. The career memoir is fascinating and the tips he gives in his writing guide are basically what you will hear or read anywhere else. But he tells you what works for him and ways you can make it ‘work for you’. — Get “On Writing” or read more reviews of it here. He does give you the ‘rules’ – follow the Chicago Manual of Style, grammar rules and cut back on passive voice – but then gives you leave to break them if it will help push the story along. 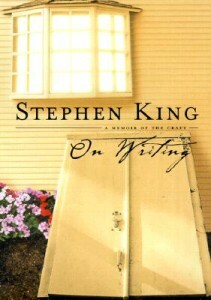 King’s main message in this book is that the Story is King and that the writer should never put themselves above writing the story the way it wants to be written. If the plot draws the reader along by being unconventional and breaking every writing rule in the book, then go with it. If the plot wants to be fast paced and action driven, then go with it. If the plot becomes mired in pages of description and then collapses in a prose stumbling heap, then cut it out and go back and redo it. If you are willing to put in the work by reading a lot and creating routines to write a lot, then you are on your way to being a consistent and successful writer. And that leads us onto my next book. 2) Write. Publish. Repeat. 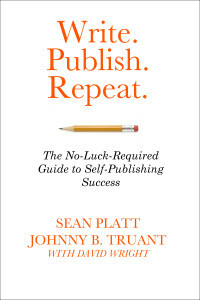 The No-Luck-Required Guide to Self Publishing Success by Sean Platt, Johnny B. Truant with David Wright. This is the book for writers to read if they want to make a living off of their writing. The authors host a Podcast called the Self Publishing Podcast where they and other indie authors talk about their experiences with writing, publishing and the marketing strategies that need to make it all run. This book is an offshoot of this show. The title itself tells you the basics of what you need to be able to get on the road to making a career of writing. — Get “Write. Publish. Repeat” or read more reviews of it here. There is a lot more to the book than just this. They go in depth into how this works for them and other successful writers and how you can get this working for yourself. They go into marketing strategies, writing routines and creating product funnels. They talk about websites, blogs, email lists, and at all points in the book they give constant warning that this will take a lot of hard work and persistence. And now onto my final suggestion. This is the book you need to read if you want to build up your author brand, your author platform and your fan base. Not only does Tim detail what needs to be on your author website, he tells you about delivering value, content and how to create that all important email list. 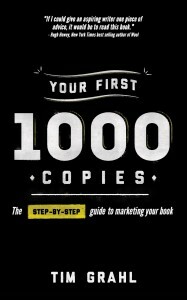 — Get “Your First 1000 Copies” or read more reviews of it here. His motto is to be ‘Relentlessly Helpful’ and Tim Grahl does that himself in spades. Tim Grahl is a professional book marketer and has helped many successful authors build and keep their fan base (Dan Pink, Hugh Howey, Michael Bunker etc). And the email list is key to making this happen. He gives you a system to build your platform and create content, get outreach and then gain permission by having people want to be on your email list. And remember that your email list is your number one marketing tool. Every writer should be focusing on building one. Anyone who has followed Tim Grahl for a while will know that is his number one recommendation to any budding career builders. And email list is a direct link to your fans and you should never give that up. So there are the three books that I would recommend to any budding, career minded writers. Those are the three that I have gotten the most out of and have enjoyed reading. If you disagree with my choice or want to recommend any other books, please tell me in the comments below. Brother, Frankenstein – IT’S ALIVE! Body of a killer, mind of a child, heart of a hero… When a troubled scientist – trying to save a young boy, and maybe himself – steals the dying child of a simple Amish couple and transplants the brain and cardiovascular system of their 11-year-old autistic son into an incredibly lethal DARPA robot, the dark forces of government come looking for their investment.Dr. Alexander and the monster escape into an Amish community to hide among the plain folk while Frank, the boy trapped inside the body of the world’s deadliest robot, learns how to leave the world of autism and understand what it means to be human and Amish. Tensions arise as the Amish begin to suspect just what kind of technological monstrosity is hiding among them, and before long hard men who do the government’s most dirty deeds will arrive looking for a killing machine… only to find a boy named Frank who has the power to defend a closed society from the worst of the world. “Brother, Frankenstein is Michael Bunker at his best. He just keeps getting better.” ~ Ernie Lindsey, USA Today Bestselling Author of Sara’s Game and Skynoise. “I just finished beta reading Michael Bunker’s new heartbreakingly awesome novel and I have this to say: Hugo Material.” ~ Nick Cole, bestselling author of Old Man and the Wasteland and Soda Pop Soldier. “…The tension between technology and agrarian simplicity runs like a bright thread through the work— those characters on the technology side are affected by the interaction with their (presumed) opposites, and those on the Amish side are changed and tested as well.” ~ Richard Gleaves, author of the bestselling Jason Crane series. “…an intriguing and suspenseful novel. I instantly rooted for Frank…” ~ Annelie Wendeberg, bestselling author of the Anna Kronberg thrillers. Michael Bunker lives, farms, and writes from an off-grid farm in Central Texas. Commonly referred to as “The Father of Amish/Scifi,” Michael has been covered in news stories and interviews all over the world as well as on NPR, HuffPost Live, Medium.com, as well as being featured in a column in the “Rising Stars” section of Ozymandias Magazine at Ozy.com. Michael’s non-fiction “plain and off-grid” writings were the inspiration for a documentary film (Beyond Off-Grid) on Off-Grid Living that will begin showing at film festivals starting later in 2015, and his family recently signed a development contract with a TV Production company to produce a reality show about their lives. Brother, Frankenstein is Michael’s newest novel, and it promises to break even more ground in the Science Fiction and Techno-Thriller genres. If you enjoyed this article, get email updates so you don’t miss the next one!